On the future of the American empire: "After a very long struggle and in the midst of a serious ecological crisis, the still dominant empire- the United States- will finally be defeated around 2035 by the same globalization of the markets (particularly the financial ones), and by the power of corporations. Financially and politically exhausted, like all other empires before it, the United States will cease to run the world. But it will remain the planet's major power; no new empire or dominant nation will replace it. The world will temporarily become polycentric with a dozen or so regional powers managing its affairs." On the future of the climate: "With the marked increase in temperature changes, very important alterations will take place in nature. Trees will grow faster and will become more fragile... Much more serious: many more coastlines could become uninhabitable. Seven of the worlds biggest cities are ports, and a third of the world's population lives on a coastline... Eco-exiles will become ten times more numerous by 2050." On the future of weapons of mass destruction: "Now pointed at Japan, North Korea's missiles will one day target the United States and China. The missiles of Pakistan fallen into the hands of fundamentalists will threaten first India, then Europe. Those of Hezbollah  in other words, Iran  that now target Israel will one day be pointed at Cairo, Riyadh, Algiers, Tunis, Casablanca, Istanbul, then at Rome, Madrid, London and Paris. Should the battle lines harden and the country be threatened with annihilation, China's missiles could one day target Japan and the United States." On the future of cloning: "After repairing diseased organs, they will want to produce them, then create replacement bodies. First they will produce lineages of stem cells without destroying the embryo, which will make genetic therapy ethically acceptable, and then reproductive cloning. Finally they will manufacture the human being like a made-to-measure artifact, in an artificial uterus, which will allow the brain to further develop with characteristics chosen in advance. The human being will thus have become a commercial object." As the cofounder and first president of the European Bank for Reconstruction and Development, Attali won fame for calling the U.S. financial collapse as early as 2006  giving him more credibility than the average soothsayer. However, many of his predictions range from the absurd to the, well... predictable. His belief that Israel must keep its status as a regional power in order to survive is not exactly rocket science, while his belief that a utopia of altruistic "transhumans" will emerge from the ashes of mid-21st century planetary warfare is a bit hard to swallow. 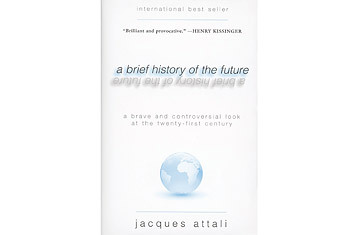 His more outrageous predictions notwithstanding, Attali correctly notes that our future is not inevitable. Mankind must learn how to appropriately respond to the crises and opportunities that await us, and grow cognizant of the fact that large-scale violence can be so dangerous to humanity so that we become "aware of the need for a radical change in attitude." Whether his predictions are worth taking seriously or not, they all inevitably turn on the endless capacity of human resilience  a notion that appears to be the only true constant for the future, and the most reassuring. Who are the 100 most influential people of 2009?